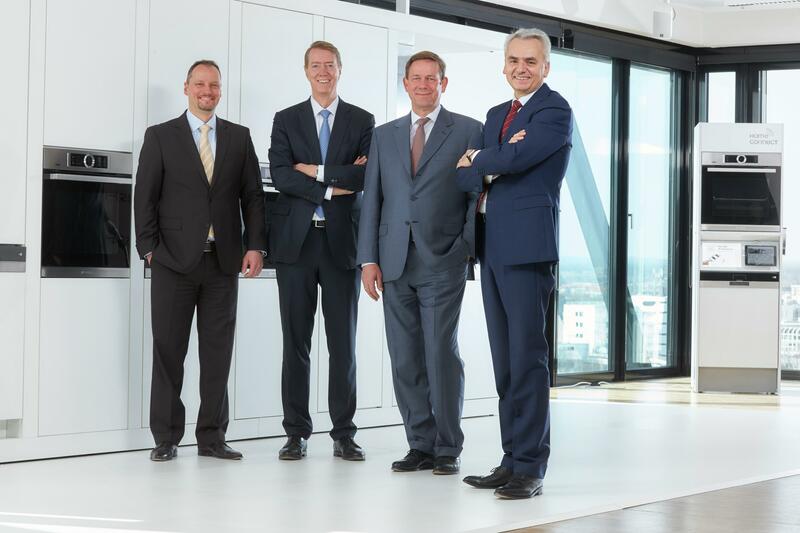 Munich, March 24, 2015 (bsh) – According to the preliminary figures, BSH Hausgeräte GmbH (BSH) was able to increase its revenue by 8.4 percent to a new record of around €11.4 billion in fiscal 2014. Adjusted for exchange rate effects, revenue grew by 11.1 percent. Earnings before interest and taxes (EBIT) rose sharply to around €700 million. Compared with the previous year's figure, which was reduced by non-recurring effects, the EBIT margin improved by more than one percentage point to around six percent. The Munich-based group employs more than 53,000 people worldwide, around 16,000 of them in Germany. One of the growth drivers in the past year was business in Europe: In a largely saturated market, BSH was able to expand its market leadership further, increasing its revenue to €6.9 billion despite the fact that the market continues to trend weakly. In North America, the manufacturer of domestic appliances benefited from high demand for premium products and dynamic economic development and posted annual revenue of €700 million. In the Turkey, Middle East, Africa & CIS region, revenue was €1.6 billion and so below the level of the previous year. The group's business performance there was impacted among other things by the sharp depreciation in the ruble and very restrained economic growth in Turkey. BSH achieved slight growth in the Asia/Pacific region, generating revenue of €300 million. Its positive performance in India, where BSH opened a factory for washing machines last year, also contributed to that. In the Greater China region, revenue likewise saw an above average increase to €1.9 billion: this region is thus BSH's second-strongest after Europe. Additional investments in the Chinese locations are intended to enable manufacture of further region-specific products. In 2014 BSH invested €373 million in research and development (R&D) or 3.3 percent of revenue, an increase of 11.7 percent over 2013. Total investments in property, plant and equipment were €443 million, of which €162 million (almost 37 percent) were made in Germany. BSH's ground-breaking investments included a new technology center for dishwashers at the Dillingen location. Approximately €100 million went toward modernizing the production lines for a new oven series at the Bretten and Traunreut production sites. This appliance series is one of the largest product projects in BSH's history; including the pro-rata R&D costs, it accounted for a volume of €200 million. Further investments are planned to keep on expanding the group's innovativeness. BSH intends to spend around €450 million on R&D this year and increase its R&D intensity to 4 percent of revenue long term. The ovens and dishwashers presented at the IFA International Consumer Electronics Fair in Berlin last fall are the first networked products from BSH. In 2014 the company launched Home Connect, a solution that enables controlling of domestic appliances from different brands with one app, only. The system has been deliberately designed to be open – and is also aimed at other manufacturers and service providers. By 2016 there will be domestic appliances with the Home Connect function in every product category; from 2018 on, all newly developed BSH appliances are to be networked – in some cases also small domestic appliances. In this regard, what counts is not what is technically feasible, but what consumers actually need. "We develop solutions that meet the needs of consumers and offer genuine benefit," says Ottenberg. New employees were hired in all regions. BSH created a total of 3,335 new jobs in the past year and employed 53,211 people by its end. 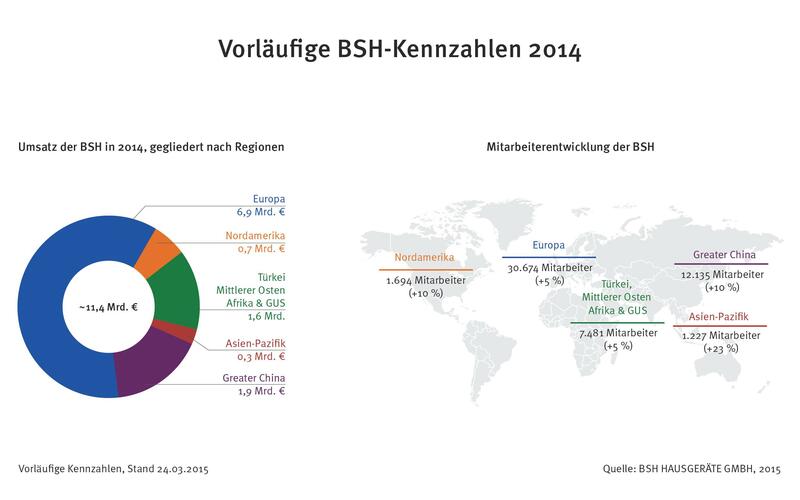 15,987 employees worked for BSH in Germany, 829 more than at the end of 2013. The increase in jobs worldwide mainly relates to the areas of production and development. "Our outstanding employees worldwide who develop, make and sell our innovative products are BSH's crucial strength," says Ottenberg. "They have a very good understanding for the regionally differing needs of consumers and how we can make their everyday life easier with our domestic appliances." At the beginning of this year, Siemens AG sold its stake in the former joint venture to Robert Bosch GmbH, which is now the sole shareholder. In this connection, the group changed its name from BSH Bosch und Siemens Hausgeräte GmbH to BSH Hausgeräte GmbH effective February 9, 2015. BSH will also continue to operate largely independently in future. At the same time, both companies will benefit mutually from their technology know-how. BSH intends to continue driving innovation, such as in fields like the smart home, sensor systems and robotics. The Siemens brand will be retained long term by BSH for domestic appliances. The final official figures for fiscal 2014 will be published at the end of May 2015 in the annual report.